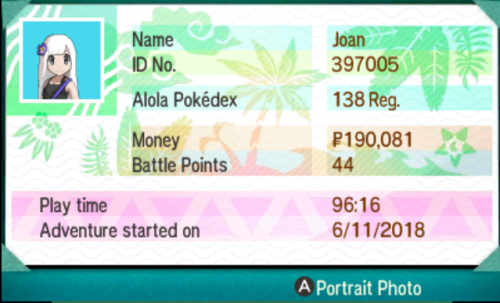 Legit Save for Pokemon Sun (7th Gen) Protagonist Name : Joan Story Completed and All legendaries caught. With Competitive Battle Ready Mons. (Box named Competitive). Here are two legitimate saves for Pokemon Y and Pokemon Omega Ruby. 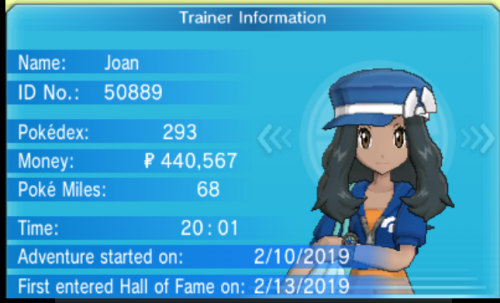 Protagonist Is Female( Name: Joan) All Legendaries Caught and Story Completed. This page contains all publicly available savefiles that were dumped from original FireRed carts, which were used to distribute MYSTRY Mew by direct trade. The distribution took place at Toys R Us stores in the United States on 30 November 2006, for only three hours from 12 - 3 pm. Each savefile is credited to who supplied it online. The recently acquired savefile that provided the missing remainder of the boxed 420 Mews is credited to PP.org, for appreciation to the group effort of those that helped obtain and pay for it. The 420 individual .pk3 files can be found here. This page contains the first ever publicly available savefile that was dumped from an original Pokemon Red cart, which was used to distribute YOSHIRA Mew by direct trade. The distribution took place at Toys R Us stores in the United States from the 8th to 12th of December 1999. The players who were allowed to obtain a Mew were determined among the first 1500 customers at each Toys R Us store on 26 November 1999, where they were able to receive a special "Peel & Win" sticker card (pictured above). 200 of these cards at each store contained the text "Caught Me!" underneath the sticker of Mew. These Mew distribution carts are known to have been either a Red or a Blue cartridge, which were sealed into a GameBoy Pocket with official Nintendo non-tamper security tape. So far only two devices have publicly surfaced on the internet. The first one was a Blue cartridge still sealed into a silver GBP, of which pictures have been on the internet for several years (pictured above). This device is said to have been lost in shipping during ownership change in 2013. The second one is a Red cartridge that has since been cut loose from its GBP, but the Nintendo security tape is still intact on the cartridge (pictured above). This Red cartridge was first seen on Reddit several months back, which is owned by a former Toys R Us employee who personally distributed Mews from the cartridge back in 1999. I recently contacted this Redditor, and offered to ship her my cart dumper in order to get the savefile dumped and safely preserved. As save data in the first two generations rely on a low-power battery, after approximately 18 years it was clear that the savefile would not have survived much longer. Due to this and the extreme rarity of these devices, this may have very well been a one time opportunity to ever preserve save data from one of these carts. Every Mew has identical IV stats: 5 HP, 10 Attack, 1 Defense, 12 Speed, and 5 Special. 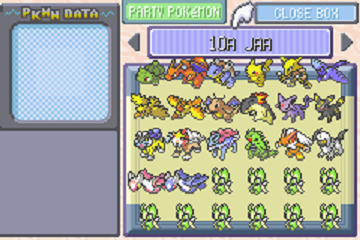 Every Mew in this savefile has the Original Trainer name of YOSHIRA (none YOSHIRB). I can only speculate that perhaps those on the Blue cartridges contained YOSHIRB Mews. The Trainer IDs are all unique however, and imply the Mews were generated in groups of 5 (eg. 16385, 16386, 16387, 16388, 16389, then 16443, 16444, 16445, 16446, 16447, and so on). My theory is that the Mews were generated with a "Mew machine", which was a quicker method used at other event locations to distribute YOSHIRA/YOSHIRB Mews. We know these machines distributed Mews with TIDs that incremented by 1, so due to the Trainer IDs we see here, we could assume that each savefile had different Mews(or at least that several different savefiles may exist). So other than TID, the Mews on this savefile are all identical. The way I figure it, a cart was inserted in a Mew machine, a party full of 5 were generated, the cart was removed, and while someone manually placed those 5 Mews in a PC Box, another cart was in the machine having it's party filled. I don't figure it could have been practical to give every cart unique Mews, but multiple carts were filled to have a wider variation of existing TIDs. After a handful of carts were full of Mews, their savefiles were likely copied among the hundreds of carts send to Toys R Us stores. Keep in mind though, this is purely my speculation based of the information we have. All the traded pokemon from this savefile had been previously released, so only the Mews remain. Box 11 and 12 are totally empty. Box 5 and 10 are each missing one or two Mews. Boxes 1 to 4, and 6 to 9 remain fully untouched. I did return a few Mews from the party to their proper box slot, so the TIDs line up as they were originally. Any oddball TIDs that couldn't be matched up were placed in the Party. I also want to note that I did request the rom to be dumped as well, and it was 100% identical to any other retail Red cart. While we were 99% positive this was obviously the case, it's still nice to have that confirmation. In the past some people have speculated whether or not the rom was special and would have the PC filled with Mews if a New Game was started. Once again, I want to give special thanks to Jenn from Reddit, because without her generosity, we may have never been able to obtain one of these savefiles. She did promise to supply her personal experience/memory of the event and any details, so when she does, that will be shared here as well. hg/ss Can extract the savefiles? Pokemon Black/White Save File NOT recognized HELP!!!! Hey I really need some help here. I am using the most recent version of No$'s Gameboy DS emulator and have the Pokemon White US ROM (I dont believe it has been Rudolph patched). Anyway, the game would get rid of the "FIGHT" option in battle and I wiped all of the AR codes I was using and re-pasted them so I could try and remedy the situation. Instead, my game now wont recognize my .SAV file. How to I get the emulator to relaod my .SAV file so I can continue playing?